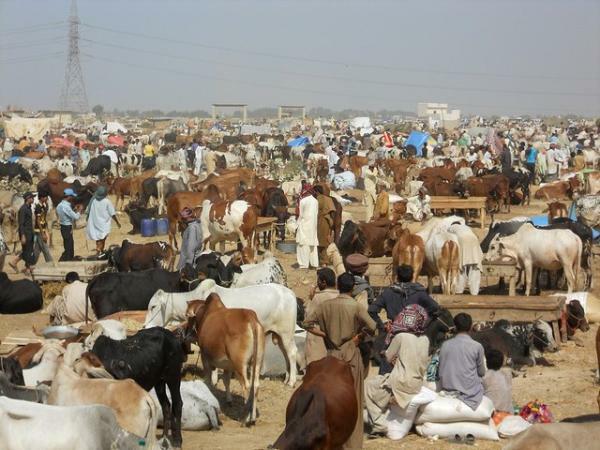 Karachi Sohrab GothGai Mandi is a good place to buy cows and bakra for bakra Eid i think people near Highway should go to sohrab goth cow mandi because who would go to Malir cow mandi it is soo far away. Yes i know where is Sohrab Goth Mandi Cows 2016... it is near to my uncle home we visit our uncle home so we also go in this Sohrab Goth Mandi. I have listen a bad News on this Year. A Congo Virus Is Viral On Sohrab Goth gai Mandi.so please take care yourself . Sharab Goat Mandi is so big Mandi in of Asia but the farmers there sell many expensive animals. You can get reasonable price animal from anywhere in Pakistan. Every animals in 2k15 are very expensive, those bull which I bought in the last year in 70,000 rupees, now it is 95,000 rupees that’s a huge difference in the price which I see in the mandi, I hope it may be down. My range is just 45,000 rupees, any one tell me that can I easily purchase the cow in my range? In this mandi all the animals are very heavy which may be start over 70,000 rupees, I am worried about qurbani. cattle farm in sohrab goth are source of earning money just they are not selling cows they are selling theri investments. hamariweb you should record a funny song or some interviews of sohrab goth mandi 2015 cows.. The cattle farm in sohrab goth are the best place to buy your desired animal, for buying a beautiful qurbani ka janwar one must visit sohrab goth cattle farms. There was a time when the photo of hamariweb.com used to be the first on google but nowadays i am seeing other website on first position. I searched sohrab goth mandi 2015 and found other website i was expecting hamariweb to be on top. This is not the picture of cow mandi 2015 please hamariweb make some sense. Visiting cattle farm in sohrab goth has become trend and now since that word selfie is originated people will behave crazy with cows and add them in selfie. Anyways its fun and i also do this when visit mandi with friends. Sohrab Goth gai mandi is very huge i am here in karachi for this year and i saw a biggest cow mandi ever i have seen in my life. Sohrab Goth Cow Mandi 2014 Gai Mandi is very expensive all cows are soo costly a man should lessen the price so that we could buy a cow or animal for qurbani ... they enjoy monopoly next time i would buy a baby cow and grow him. This time the whole area of mandi is cover for every types of sacrificing animals and the VIP section is separate from simple mandi. I want to sell my cow in Sohrab Goth Gai Mandi 2014 i have two cows from Sibbi both are full white colored and very innocent home grown and familiar with kids and friendly nature cows. How can i sell my cows on internet? Sohrab Goth Gai Mandi 2014 is the best Cow Mandi of the world... I was in Pakistan last year so i had a lot of fun and tafreeh with my fellows now i am in Dubai and missing those enjoyable moments of Bakra Eid. we do not buy cows from Sohrab Goth Gai Mandi we bring our cows from our village, there we grow them up and give them good healthy food every year our cows are biggest in the society and people come from other areas to fee and capture photos of our cow like the do in Cow Mandi... Our cows are better than shah cattle farm and dispasand cattle farm. Sohrab Goth gai Mandi is very bad place i got flu since i visited the place, i have dust allergy that is why i have to stay away from from sand after all of that i have to go to Sohrab Goth Mandi for buying a cow. This is not recent picture of sohrab goth mandi.